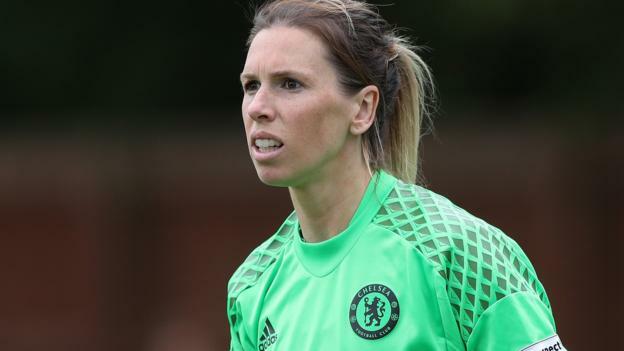 Through a statement on their official website, Chelsea have confirmed that their Women’s goalkeeper Carly Telford has extended her contract with the club until 2021. Telford returned for a third spell with The Blues in 2017 and was part of the squad that won the WSL and Women’s FA Cup last season. An England international, Telford is sharing goalkeeping duties with Sweden star Hedvig Lindahl at Chelsea, and her goal now is to cement her spot as the undisputed number one. The 31-year-old Newcastle native said : ”For me, it’s about working hard and working harder than I have ever done before and learning from Hedvig and Ann but making sure I’m beating them in all aspects and areas. ”I need to make sure I am on that pitch and when Emma and Paul sit down to make their team choices on a weekly basis I am the first one down on the sheet.” Newcastle United Academy, Sunderland, Leeds Carnegie, Perth Glory and Notts County are the other clubs Telford has represented. It’s hard being a goalkeeper because I could go to a lot of clubs and play every week, but for me it comes to a bigger thing which is the coaching. There isn’t a guarantee that you are going to get coached well as a goalkeeper. Not a lot of clubs have good goalkeeping coaches or have goalkeeping coaches. I didn’t have one at Notts County for three years so to come here and work with Stuart Searle, who for me is one of the best goalkeeping coaches in England, if not Europe, I love it.